The rush of riding Insanity the Ride: it has seats tethered to an arm that swings out beyond the tower leaving riders dangling 1000 feet in the air. As the ride begins its circular motion, the seats rise and tilt downward to the Strip. The element of extreme fear is always in the back of your head. 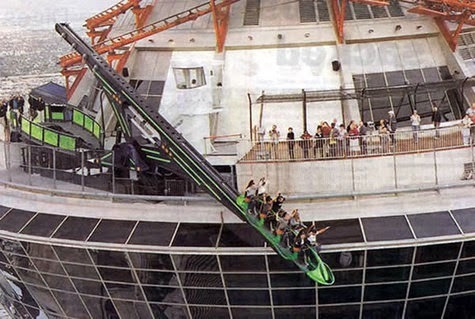 For the longest time I've expected one day to read in the newspapers that the riders of the roller coaster on top of the Stratosphere Casino would plummet to their death in the ultimate of theme park carnage. It hasn't happened yet but it's bound to happen (or has it)? You may be asking yourself if there's any record of anyone dying on these thrill rides and the answer, surprisingly, is yes. Of course in every occasion, the deaths were considered suicides, however you can decide if the coroners were persuaded in their judgement or not. If death doesn't get you a power-outage or high-winds might. Both situations have occurred and in both instances it resulted in passengers dangling upside down over side of the tower for hours. 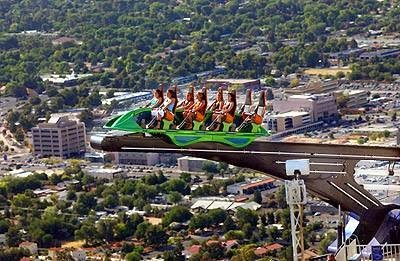 If that's not enough to satisfy the thrill seeker in you, don't forget your on the biggest lightening road in Nevada. Maybe that's why I never rode the stratosphere roller-coaster? Maybe my experience inside of Las Vegas casinos taught me that the House always wins, and the odds are in the favor of destruction when you consider the probability for mistakes both in construction and inspection (do they really check every nut?) of a very unique amusement park on top of the Stratosphere Tower. That one mistake may shoot me off the top of the casino in a blazing stream of coaster cars, resulting in the most uneventful of deaths.Then again maybe that's the way to go?